Nandini Sudhir – It was very interesting. I played the Campo from the Preludios Americanos by Abel Carlevaro for him. It was actually Maestro Abel Carlevaro’s 100th birthday that day. David Russell told me a lot of important points to look into and practice. The first thing he told me was that while playing, if you play a note and you are not happy with it, do not go back and play it again right away, but go on. He made a very nice comparison…he told me that human beings are not perfect…when i was playing i went back and played some notes..he instructed me to avoid doing that and to try to establish some security in my playing. Secondly he told me many technical things especially in regards to the piece i was playing […Here Nandini demonstrated a few things which David Russell had talked about in the masterclass…]. In the first section of this piece, the melody is in the bass but in the second part the melody moves to the treble. He asked me to stress on a few notes and make the melody in the higher register louder and try to make it sound more magical. We could only cover half the piece in the masterclass. Nandini Sudhir – I could not believe that this legend was sitting in front of me and i got the opportunity to play for him. It was really lovely and is something i was looking forward to since 2012. PGS – How has been your experience this year at the Calcutta Classical Guitar Festival? Nandini Sudhir – This is my most favorite festival…in all the festivals that i have been to! PGS – Which festivals abroad have you been a part of? 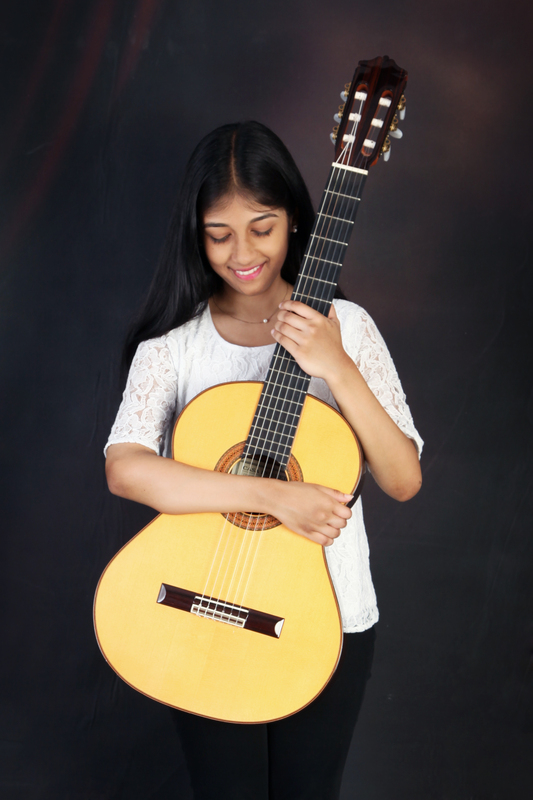 Nandini Sudhir – First i went to the Thailand Guitar festival after i won the national competition here. The prize was an opportunity to go to the Thailand festival. There on the jury was the guitar-recorder duo ‘Duo NIHZ’. They invited me to the Nordhorn guitar festival in Germany and since then i have been going to that festival for the last four years. I have won some prizes there. I won the second prize at the Nordhorn festival for three years in a row and last year I placed first at the same festival. I won the first prize at the Twents Guitar Festival in Enschede. Aakash Saha won a prize there as well a few years ago. Nandini Sudhir – This is family. This is home! Every december i keep this week free to come back home to my family! Its like a home festival. I can be myself here. Everyone is one big family in spite of the fact that everyone comes from different parts of the country. Its a nice time to share music and other things..
PGS – What are you working on currently? PGS – How do you look at your journey with classical guitar going forward? Nandini Sudhir – Definitely i want to pursue music as my career and profession. Currently i am completing my bachelors in Psychology, Economics and Sociology in Bangalore. After this, i hope to join a conservatory in Europe and pursue my music studies there. Maybe do a bachelors degree in music performance…i really want to use music to help people and reach out to people. I might consider music therapy for this..I will be completing my degree in psychology next year…but music performance is my main passion. PGS – Would you like to share some thoughts for players and students of your age or younger? Nandini Sudhir – You should never be discouraged by what you might consider ‘failures’…everyone has their share of good and bad performances. But i think its important not to get disheartened if you make mistakes and it’s also important not to get too proud either. Its very important to stay humble…I think every young guitarist should keep in mind that patience and commitment is required. PGS – Do you spend time listening to music? Nandini Sudhir – I listen to a lot of classical guitar music. My favorite player is Marcin Dylla and i listen to a lot of his music…and also all the other great classical guitar players. Last October i have also started teaching at the Bangalore School of music. I have three students..they are 9, 10 and 14 years. One of them has composed a piece of his own at the age of nine and i am very proud of him! He is very musical..
PGS – Thank you Nandini and best of luck for your future musical explorations!